Listen to your favourite songs in music player. It supports MP3, AAC, AAC+, eAAC+, WMA, M4A (Apple lossless), MP4 etc. file types. 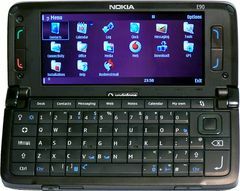 The Nokia E90 Communicator is equipped with Bluetooth, Wi-Fi, and GPS, and has a solid set of productivity and communication features for the business user. The Symbian smartphone also has a full QWERTY keyboard and 3.2-megapixel camera. The Nokia E90 doesn't support U.S. 3G networks, and speakerphone volume is a bit weak. The handset is also heavy and bulky.